Plumbing Trade Magazine is supporting Quality Plumber Week (1 - 9 October 2018) to celebrate the skilled work plumbing and heating engineers carry out every day. Organised by Association of Plumbing and Heating Contractors (APHC), the fifth Quality Plumber Week aims to recognise the diversity and range of skills plumbers have, which is often overlooked until an emergency leak or broken boiler requires attention. The week works to raise consumer awareness of using properly qualified, trained and accredited plumbers in a bid to reduce the number of rogue traders operating in the trade. In 2018 APHC will be promoting the importance of continuous skills development to the industry and reminding the public about the importance of choosing an appropriately qualified plumbing and heating engineer, providing advice for sourcing a quality plumber and reminding consumers to always check credentials. 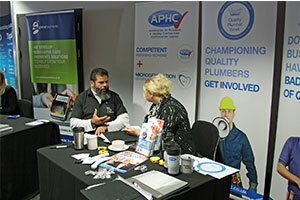 John Thompson, Chief Executive, APHC added: “Quality Plumber Week aims to unite the plumbing industry to showcase the important work that we do in keeping society healthy, warm and safe. I hope that everyone will come together to celebrate our industry and help raise the awareness amongst consumers of the many highly qualified and proficient professionals that we have in our industry. For more information on Quality Plumber Week visit www.aphc.co.uk or to find a local quality plumber visit www.findaqualityplumber.co.uk. To join the conversation on social media follow #QPW18. • The Association of Plumbing and Heating Contractors (APHC) is a not-for-profit trade body for the plumbing and heating industry in England and Wales. They have been established since 1925 and represent large companies working on commercial projects, to sole traders working in domestic properties. • Being a member of APHC distinguishes professional businesses from the rogue traders. The association is committed to helping plumbing and heating contractors run professional and profitable businesses, whilst ensuring consumers have better standards of workmanship and service.